We are specialized in offering one of the most entertaining and unique casino parties to our clients. We take pride in creating a wonderful gaming environment with an amazing soundtracks, professional casino-style tables, chips and everything – we have it all! Whether it is a corporate event, birthday party, friends gathering, charity fundraiser or any such event, we are committed to offering the best in a Vegas style affair! There are themed parties for different parties to offer the best ever experience. Additionally, you can also add some theme to your party as per the choice. B.A.M Casino Parties in Union City offers a wide variety of casino games like roulette, crap, blackjack, poker and much more. From the foods and beverages to gaming and decorations, let us take care of everything! We at BAM Casino parties, Union City, pride ourselves in our ability to make your event unique and special. We believe that our huge success is because of our client’s trust in us and we treat your event as if it is our own. We ensure that this party becomes the perfect way to entertain your guests in the best possible way. Whether you want to impress your clients or motivate your team fellows, we create the best gaming environment. Surely to mention that good relationships are growing on our tables where team members are high-fiving their wins and celebrating it to the fullest. Budget? Don’t worry about this! We let you decide how much you are willing to spend on your party and based on the funds, we make a list of things needes. Theme – You can pick any theme to add glamour to your party. From a Gatsby theme to 007 royal casino party theme, we have an endless options for you. Experienced Dealers – A well-experienced team of professionals will take care of every activity. Our dealers are well-trained in making your event authentic, entertaining and fun for all your guests. 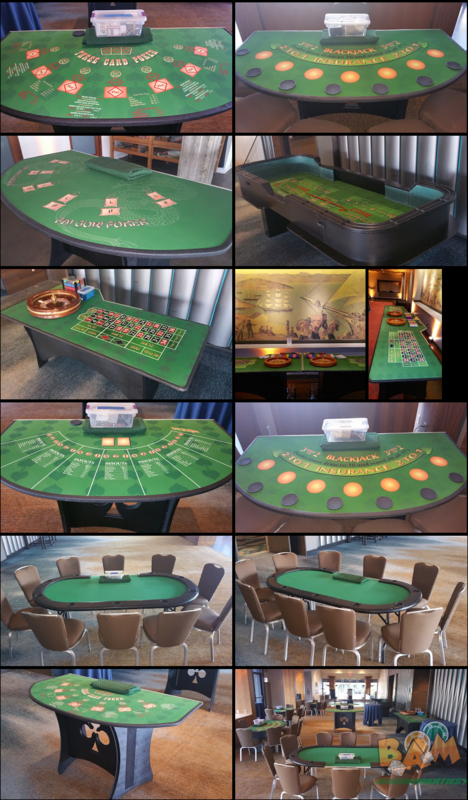 Equipments – For your convenience, we have a wide range of casino party rentals that will help you in choosing a variety of games and options to offer the best casino nights for your guests. We believe that you can’t take everybody to Vegas then why not bring the Vegas here with us. At BAM casino parties, we create the ambience you desire. No matter, if it is going to be a casual party or you are thinking of a sumptuous event, we will make it wholly unforgettable for you. Craps – This casino game is also known as ‘casino craps’ or ‘table craps’. A dice game in which the players make wagers on the outcome of a pair of dice. It can be the outcome of one or a series of rolls against which players may wage money or a bank. Roulette -Roulette is one of the most popular European game which is played with a dealer spinning a ball around a spinning horizontal wheel with 36 numbers and two zeros. The table layout provides players a place to wager chips and try to guess where the ball will land. BlackJack – New to blackjack? Blackjack is a very popular card game played at casinos. To start with, you are dealt with two types of cards – one face up and the other face down. The main objective while playing Blackjack really is not to go over the amount of 21. Texas Hold-Em Poker -This game has become the world’s most popular poker game played at live casinos. In this game, each player is dealt with two types of cards – hole cards and community cards where hole cards are two and open cards i.e. community cards 5. The objective of the game is to eliminate all the opponents present on the table by winning all their money. San Francisco, Millbrae, Daly City, Hillsborough, Burlingame, Oakland, Alameda, Fremont, Sunnyvale, Hayward, San Ramon, Belmont, San Carlos, Redwood City, Atherton, Milpitas, Palo Alto, Los Altos, Mountain View, Santa Clara, San Jose, & many more.